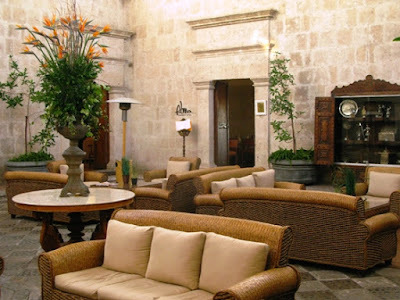 We stayed at a variety of hotels during our trip to Peru, an increasingly popular country for travel. If the Andean Highlands region of Peru is on your travel list, check out these exceptional hotels. Whether located in the city center or secluded in remote regions, accommodations like these in Peru’s High Plateau offer a banquet of history, nature, and culture. 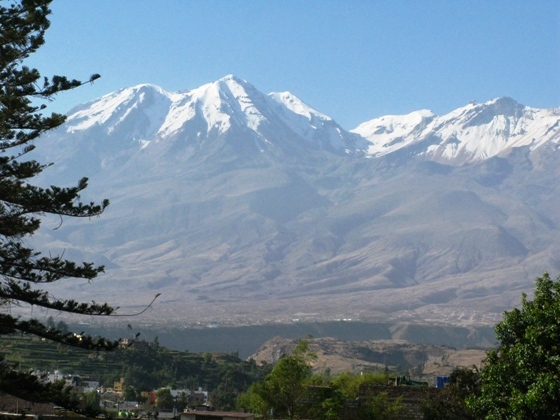 Arequipa, in southern Peru, is the historic center of the Highlands Region. Its Inca legacy is overshadowed by remnants of the Spanish colonial period, and that includes the renovated house that became the foundation for Casa Andina. This Spanish mansion, named a National Historic Monument, has been expanded into a centrally located luxury hotel that’s as much museum as accommodation. Courtyard of Casa Andina in Arequipa, Peru. A restoration project rescued the mansion from a century of neglect and transformed original two-foot thick stone walls into five large suites. High vaulted ceilings, frescoes, and original flooring—a herringbone pattern of rocks embedded in stone—maintain the colonial character. A modern two-story section with 36 additional rooms overlooks an open air sitting area made comfortable with wicker sofas and chairs. 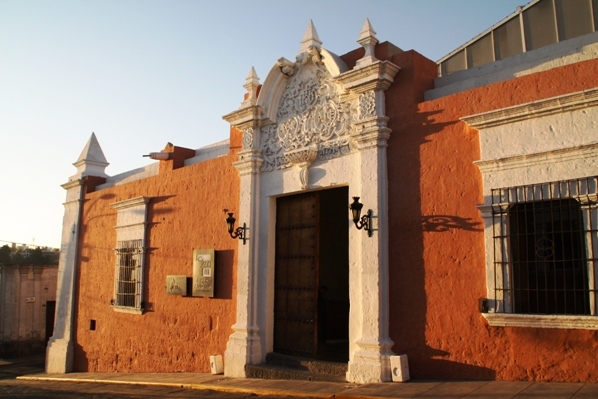 Casa Andina is quiet, even though it’s just around the corner from the tourist attraction, 16th century Santa Catalina Convent, and a few blocks from the main square. Dine: A full buffet breakfast is served either indoors or outdoors by the main courtyard of the hotel. For lunch or dinner, enjoy the beautiful gardens of Sol Del Mar in Arequipa. who wantto hike in Colca Canyon. Built completely of stone, mud bricks, and thatched roofs, ColcaLodge is an oasis in the middle of the sparsely populated Colca Valley. Its architecture was inspired by ancient Inca buildings, perfectly appropriate since it’s located in farmland heavily terraced by Inca and pre-Inca cultures--and still cultivated using ancient methods. Located next to the Colca River, the lodge features beautiful views from the lovely spa and naturally soothing hot springs. Sunny orange stucco buildings and plenty of colorful flowers brighten the scenery, and numerous paths allow for gentle exploration around the property. Natural hot springs invite guests to soak and relax. Feather comforters and luxury showers also make the 45 rooms a prime choice for serious hikers in the Colca Canyon (the world’s deepest canyon) and visitors heading out to observe the famous condors of this Andean valley. Dine: Colca Lodge’s fine restaurant offers a varied menu for breakfast, lunch, and dinner—including tasty soups and barbeque (alpaca, anyone?). Staff will pack a generous lunch to-go if requested. Situated in a rural area overlooking Lake Titicaca (at 12,500 feet altitude it’s the world’s highest navigable lake), art-filled Hotel Titilaka considers sharing historic and cultural experiences as important as pampering guests. A few years ago Peruvian developer Ignacio Masias purchased an existing hotel on a private peninsula jutting into Lake Titicaca. After renovations, eighteen large, contemporary rooms now gleam with walls of windows that take advantage of spectacular scenery and connect guests with the natural environment. 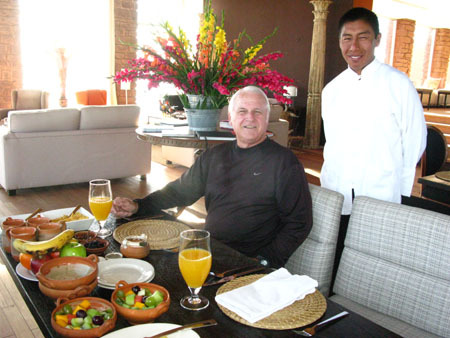 The hotel’s signature program is The Andean Experience, which includes transportation to and from the Juliaca airport, numerous excellent tours led by local residents, and all meals and drinks. Excursions that revolve around local culture allow this stunning retreat to promote economic development of nearby communities. Breakfast is a sumptuous affair with impeccable and personalized service. Once guests arrive at this tranquil oasis they are catered to by gracious staff, about half of whom are indigenous people from local communities. The hotel provides indulgences indicative of a first class property: heated floors, spa bathrooms with oversized tubs and massage showers, indoor chaises with gorgeous lake views, spacious double vanities, and complimentary stocked mini-bar. 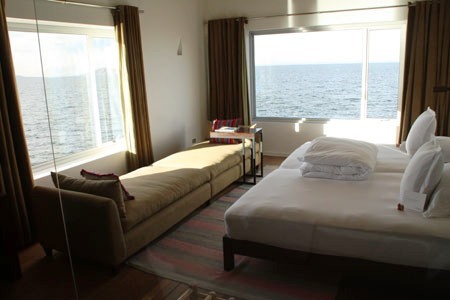 Superb views of Lake Titicaca from our room. What the hotel doesn’t have—and doesn’t need--is easy access to the bright lights of city nightlife. Instead, the spirit of ancient civilizations soothes the soul. Dine: You couldn’t beat the on-premises restaurant for fresh seafood and vegetables—even if there were other options nearby which there aren’t--and everything is included.